Last Tuesday, I was finally able to implement a plan for a Japanese lesson I’d had my heart set on: using sushi to teach Japanese vocabulary. It was a strong success. Somehow, people just remember things about food very well. It must be genetic. Sushi comes in wide varieties. The picture above is funamori, and to explain simply, fune is Japanese for “ship.” More broadly, think of the English word vessel and you might grasp the rest: it’s sushi served in a vessel of some sort. 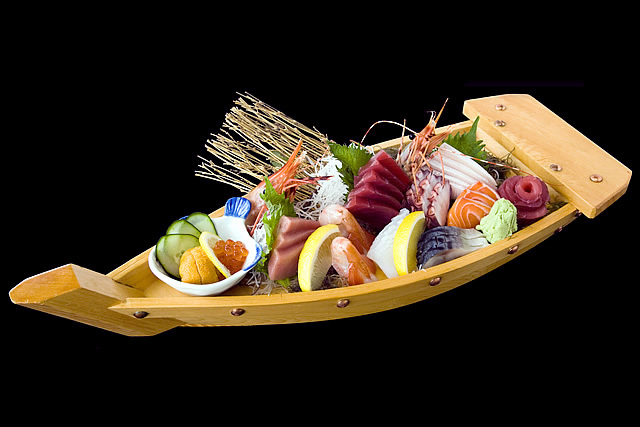 In ancient times, this was usually a lobster shell, but the “ship” theme caught on, and anything looking like a ship or boat or what have you, is employed to serve funamori style sushi. The objective reason for using this in a lesson was to provide vocabulary for the formation of sentences. Forming useful sentences at an early date is the entire focus of my current style, and part of it is for critical short term reasons: keeping morale high, giving the learner a sense of advancement and progress, and driving the level of frustration to a low and insignificant level. It’s not just about having fun; really, it’s not. It’s about the feeling of empowerment vs. helplessness. Of course, helplessness is a normal feeling for people learning Japanese. Hence, why I seek to dispel it. Besides this, the verb I use as the penultimate beginner’s verb is taberu, “To Eat.” Having a verb for eating without discussing anything to eat is a rather impoverished way to go about it. Besides this, I strive to never forget that the Japanese language is a bridge to culture, with food culture being one important aspect of this. Learning the language is important, but we must not lose sight of what learning language is for. The next lesson with this particular girl will concern where and when eating is taking place, or is to take place, or with whom it takes place. This allows us to focus on particles we have not yet addressed. Simplicity is important to ingrain the early steps, but it is also important to follow up. Fortunately, I am very pleased with overall progress and the “sushi lesson” (which she enjoyed greatly) seems to have sunk in quite well. I can throw in sushi terminology in future lessons, essentially at random, to have fun and, more importantly, further ingrain this useful terminology. This entry was posted in Culture, Japan, Japanese, Languages and tagged culture, food, funamori, Japanese, language, sushi, teach, vocabulary. Bookmark the permalink.